Dr. Albert Chi has seen the destruction of war firsthand as a trauma surgeon and observed countless lives forever altered through the loss of limbs. 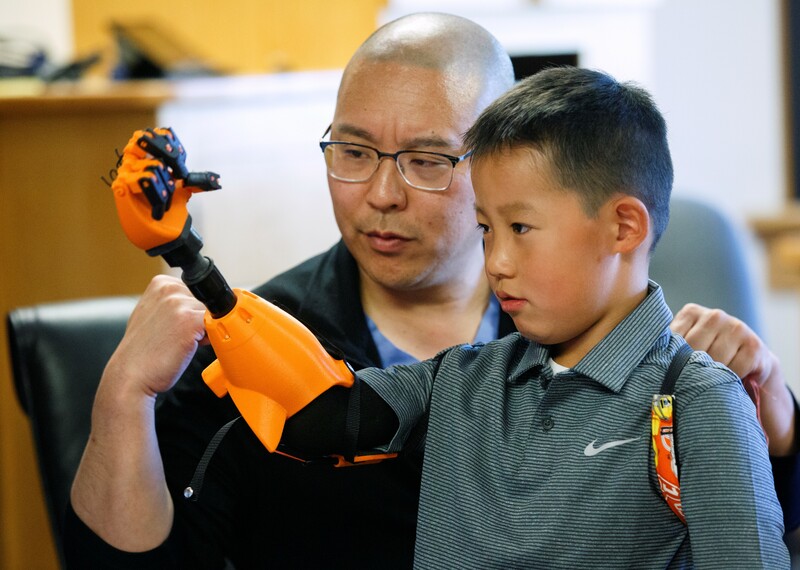 Now, after years of research, he’ll showcase the amazing robotic arm he has developed that is revolutionizing the field of prosthetics, when he delivers the OHSU Foundation’s 2018 Calvin and Mayho Tanabe Address. Chi will present “Bionics: The Evolution of Man and Machine” on Tuesday, Oct. 23, at 7 p.m. at the Newmark Theatre in downtown Portland. The Calvin and Mayho Tanabe Address was established to offer differing perspectives on important topics. The lecture features national and international speakers who bring diverse ideas to the community and encourage a free exchange of ideas. Chi is an associate professor of surgery (trauma, critical care and acute care surgery) in the OHSU School of Medicine. His experience as a trauma surgeon motivated him to create a new generation of advanced prosthetic limbs – including a thought-controlled bionic arm – that are dramatically changing lives and garnering national attention. One of his patients, Johnny Matheny of Port Richey, Florida, will join him for the Tanabe Address to demonstrate the extraordinary robotic arm that allows him to do everything from pick up a single grape to play the piano. Chi came to OHSU in 2016 from Johns Hopkins University, where, among other duties, he served as medical director of the Targeted Muscle Reinnervation Program and learned more about the possibilities of the mind-body interface. His previous training in biomedical engineering, coupled with his experience as a U.S. Navy trauma surgeon during Operation Enduring Freedom, led him to imagine a new era of “futuristic” prosthetics that could be controlled by the mind. Matheny has undergone TMR surgery, performed by Chi, to “reassign” nerves that once controlled an arm and hand he lost to cancer so that they could communicate with a robotic prosthetic. Chi is also lead clinical investigator in the first U.S. clinical trial of bionic arms for children produced on 3D printers. As a young man, he nearly lost his life in a motorcycle accident, and that experience has been foundational in his approach to his career. For more information on the Tanabe Address and to purchase tickets, click here.